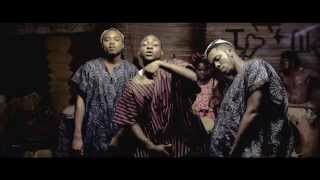 #NigerianMusic: Featured on Nigeria Music Network is the official music video for D'Prince new single 'Gentleman' featuring Davido and Don Jazzy. Watch, Comment and Share on your social networks! #Highlife. The three D's: D-Prince, Davido and Don Jazzy, nice collaboration! The music video was directed by Clarence Peters of CAPital Dreams Pictures. "Mavin Record’s Superstar Artiste, D’prince is bringing his exceptional brand of smooth, catchy and introspective music to the Nigerian music factory. He is gearing up to celebrate a rewarding new year by dropping a classy video titled “Gentleman” featuring Davido and Mavin boss, Don Jazzy. The track which was produced by Nigeria’s super producer Don Jazzy, and video directed by prolific cinematographer/ video Director Clarence Peters with costumes styled by Okunoren Twins, has generated much anticipation on the social media. The song, possibly the first of its kind in the Nigerian music scene, leaves charming wedding sensation into your ear drums. It invites its listeners to love and cherish their relationships. The song has a relatively semi fast-paced beat that is rather inviting with a sound that is not quite oriental but breathes a distinctive modern flavor of the Nigerian wedding setting. Music video by D'Prince performing Gentleman. 2014 Mavin Records. Download Link : bit.ly/gentleMAN. Text 702862 to 4100 to use Gentleman as your MTN Caller tune."